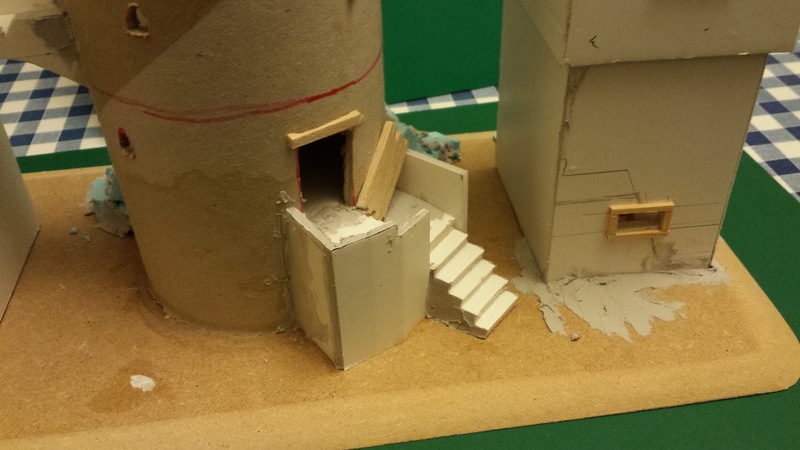 I am aiming for reasonably detailed but playable, rather than highly detailed diorama quality. So with that in mind I have left the timber detailing and moved on to building the rubble piles around the ruined parts of the buildings. 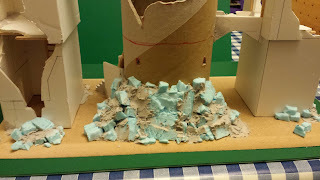 For most of the bulk of the rubble I have used roughly cut chunks of blue insulation foam (styrofoam). 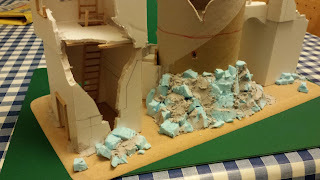 I hacked them up very roughly and in some cases just broke pieces apart, as this gave a nice rubble like effect. 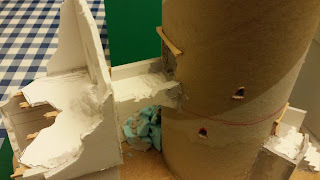 I used a PVA based woodglue to stick the chunks of styrofoam down, and slowly built up the piles. Once the glue had set I used some grey tiling grout to fill in gaps and give a more cohesive look to the piles. 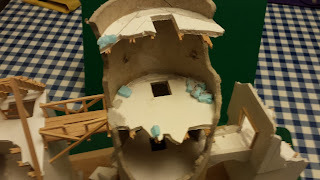 I added one or two bits to the upper floors of the tower, although I didn't want to limit the floor space too much, as it is important that there is enough space for the figures to be placed. On the subject of placing figures, the rubble piles are laid out in a purely representative way. 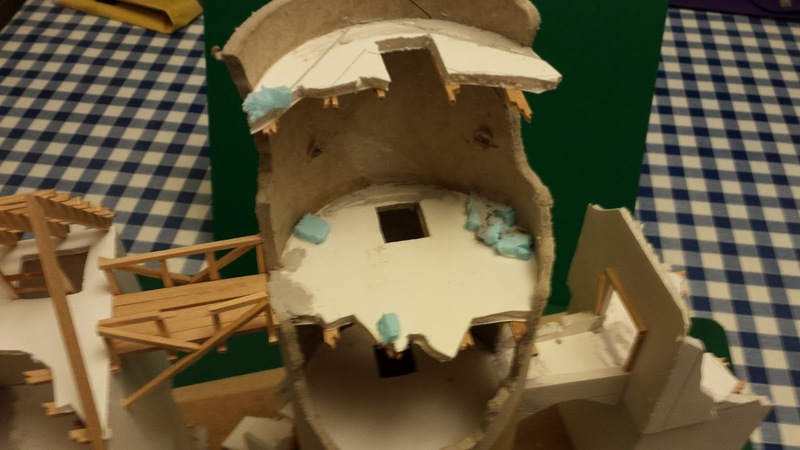 If the these buildings had really collapsed there would be a lot more rubble and placing figures would be a lot more difficult. This is a compromise that should means the model looks good but is still usable on the gaming table. While I have the grout out I used it to fill some of the joins where there were unsightly gaps. Once again I have not been too neat with the grout as the ruined buildings will need quite a rough finish anyway. While taking these photos I have noticed that there is one (damaged) window that I have missed adding a timber frame to. So that will be my next job. 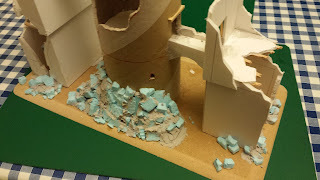 Then I will be adding some sand to the model. Looking good. I will have to do something similar very soon. The half constructed buildings are coming along really nicely. Just out of curiosity, what will you be doing with the rubble to complete it? I mean, will you be adding sand to the plaster mix? Or will the plaster will look good on it's own when painted? I'd be interested to know what methods you'll be using, as I think very highly of your work. I have not 100% decided yet. 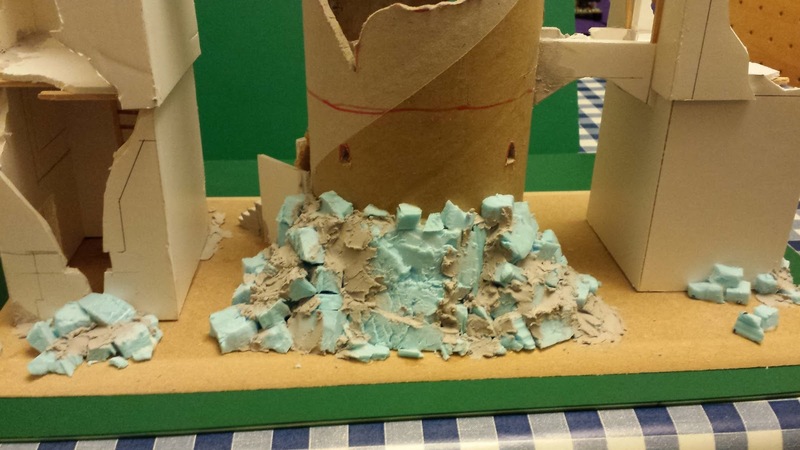 I will probably add areas of sand, I use very fine grain (play pit) sand, as well as normal course grain building sand. Looks very nice so far, creative job!